His Highness the Aga Khan with UNHCR chief Antonio Guterres at UNHCR Headquarters. Photo: The Ismaili. His Highness the Aga Khan visited the UNHCR headquarters on November 6, 2015 to meet UN High Commissioner for Refugees, António Guterres, and discuss past and future cooperation in emergency operations around the world. His Highness is the 49th hereditary Imam of the Shia Imami Ismaili Muslims and nephew of the late Prince Sadruddin Aga Khan, who was high commissioner for refugees from 1965-77, a pivotal period in the organization’s history. His Highness was greeted by UNHCR staff before he held private talks with the High Commissioner followed by a meeting with senior UNHCR officials on the long-standing partnership between the Aga Khan Development Network (AKDN) and the UN refugee agency. The two sides looked at ways of further strengthening their partnership in the Middle East, Asia and East Africa. They discussed possible new joint initiatives in areas such as contingency planning; pluralism and diverse societies; and country specific cooperation in areas where AKDN is active as well as global advocacy to bridge the humanitarian-development divide. They also discussed the global political situation and the effects of extremism and sectarianism on previously tolerant and diverse societies. Prince Sadruddin Aga Khan, uncle of Mawlana Hazar Imam, His Highness the Aga Khan, led the UN refugee agency during 12 years in the 1960s and 1970s, leaving an indelible print on UNHCR’s history. He led the agency through some of the most challenging moments, and his name became synonymous with UNHCR. Prince Sadruddin became High Commissioner in January of 1966 at the age of 33 – the youngest person ever to lead UNHCR. Prior to becoming High Commissioner, he served for three years as Deputy High Commissioner. He was at the helm of the UN refugee agency during one of its most difficult periods. This included the 1971 the Bangladesh crisis, which uprooted 10 million people, the 1972 exodus of hundreds of thousands of Hutus from Burundi to Tanzania and the Indochinese boat people tragedy of the mid-1970s. In 1972, Prince Sadruddin played a key role in finding new homes for tens of thousands of South Asians expelled from Uganda by Idi Amin. Prince Sadruddin’s entire adult life was devoted to humanitarian work. After leaving UNHCR at the end of 1977 at his own request, he served in various capacities, dealing with humanitarian situations in many parts of the world on behalf of the United Nations. These included Afghanistan and Iraq during the first Gulf war. He was also a trustee of a number of charity organisations. He published several books and received numerous national and international decorations, including the French Légion d’honneur and the United Nations Human Rights Award. 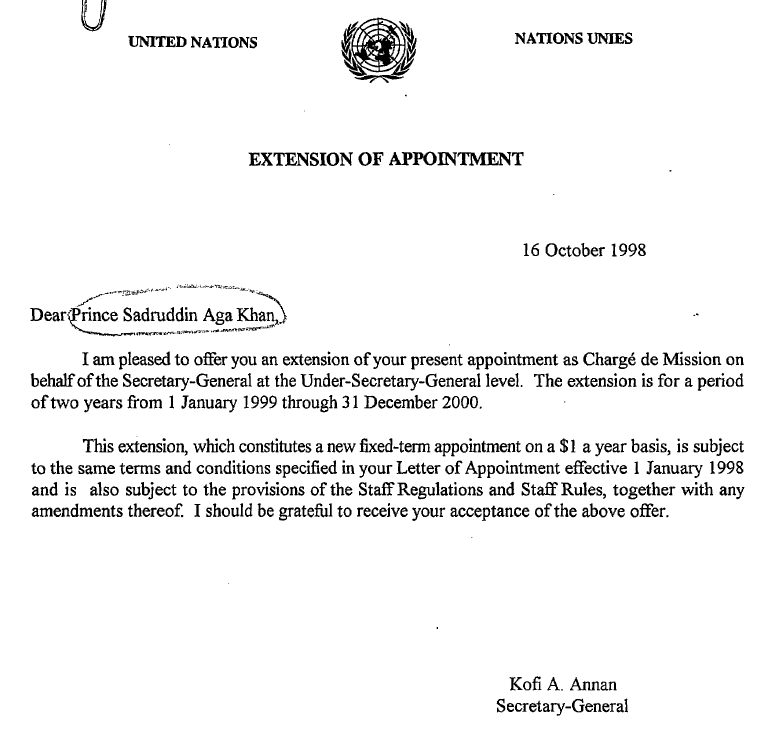 Simerg has come across many pieces of letters and documents on Prince Sadruddin in the UN archives, and we reproduce two below that serve as reminders of his priceless services to the United Nations. Date posted: Saturday, November 7, 2015. 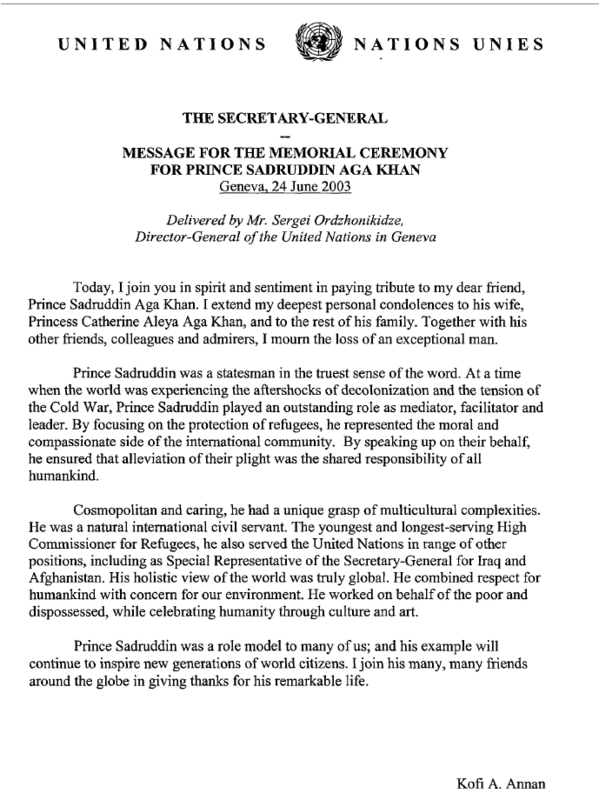 Report of His Highness Aga Khan’s visit to UNHCR and Prince Sadruddin Aga Khan’s profile compiled and adapted from the website of http://www.unhcr.org. The following are thematic excerpts from remarks made by His Highness the Aga Khan at the North-South Prize Ceremony, Senate Hall, Parliament, Lisbon, on June 12, 2014. This award, first of all, has special significance because of who shares it – Madame Suzanne Jabbour. Her dedication to those who are tortured is an example that inspires us all. I know she will agree when I mention the list of those – from both South and North – who have received this award since 1995. It is a moving experience to have one’s work recognized alongside theirs. …this prize has particular meaning because of those who organize it – the men and women of the North-South Centre of the Council of Europe, who contribute so much to advancing democratic citizenship in our world. The Aga Khan Development Network has been proud to join with the Centre in distinguished projects such as the annual Lisbon Forum held at the Ismaili Centre. The significance of this award is also enhanced for me by the fact that it has been presented by the President of Portugal, in the presence of so many eminent leaders, and in this splendid Parliamentary setting. The Ismaili Imamat and the Aga Khan Development Network have had a long, close relationship with Portugal, built on shared values. Over many centuries, Portugal has welcomed and integrated people of diverse cultures. It was here on the Iberian Peninsula that Al-Andulus flourished for so long as a model of effective pluralism, a home for Christian and Jewish peoples that was also part of an Islamic empire…. The North-South prize affirms principles which have long been animated and sustained by the work of the Aga Khan Development Network. Our Network seeks in many ways to improve the quality of human life, in health, education, in cultural and economic development. But our core conviction is that human progress depends on human cooperation, even across difficult lines of division. As I observe the world, I am struck by the insufficiency of well-informed debate, of richer dialogue, of deeper education in our quest to avoid human conflict. That insufficiency often plagues relations between the North and the South– and increasingly between the North and the Islamic world. Some have called this a clash of civilizations—I think it is, essentially, a clash of ignorances. What it means, in any case, is that institutions such as the North-South Centre have never been more important. A related problem is the failure of so many to recognize that pluralism is not only a growing fact of life but also a blessing for their communities—an opportunity to be welcomed rather than a threat to be feared. Since ancient times, great cultures have thrived because of their openness to diversity, and not because of their exclusivity. It was to address this issue that the Government of Canada and I created a new Global Centre for Pluralism in Ottawa in 2006. Recently the Global Centre held its Third Annual Pluralism Lecture….our guest lecturer was Antonio Guterres, United Nations High Commissioner for Refugees since 2005….His recent Lecture described, eloquently, the unprecedented scale and severity of the world’s refugee crises. He addressed, passionately, the moral challenge this crisis presents, the tragic impulse of some to exploit it, and the critical importance of standing together on behalf of human tolerance. I commend his words to you; they resonate powerfully with the purposes of the North-South Centre. We inhabit an overcrowded and interconnected planet and yet we share a common destiny. A weakness or pain in one corner can rapidly transmit itself across the globe. The pervasive rejection of pluralism in all its forms plays a significant role in breeding destructive conflicts. An example is the current situation in the Middle-East, where conflict is having a profound destabilising impact — in the region but also well beyond — including here in Europe. Instability is infectious, but so is hope. And that it is why it is so important for us to carry the torch of hope as we seek to share the gift of pluralism. Pluralistic values have been articulated since ancient times. Profound expressions about our common humanity are embedded in the world’s great religious traditions, including my own. But now it is for us to re-articulate those traditions. As we do so, our support for one another can be a source of renewed and growing strength. It is ironic that a sense of intensified conflict comes at a time of unprecedented breakthroughs in communication technology. At the very time that we talk more and more about global convergence, we also seem to experience more and more social divergence. The lesson it seems to me is that technologies alone will not save us– the critical variable will always be and will always lie in the disposition of human hearts and minds. I am grateful for the opportunity to share with all of you in this experience – and in the great purposes to which it calls us. For links to numerous other pieces on the Award Ceremony please click on http://www.ismailimail.wordpress.com. For a comprehensive coverage of the speeches of His Highness the Aga Khan, please click on http://www.nanowisdoms.org. Please click on photo for Prince Sadruddin Aga Khan Speech. UNHCR photo. Copyright.